Hey there, summer readers! Have you accepted our summer reading challenge? While the summer reading program for kids and teens has always been popular, I’m not convinced everyone has heard about our summer reading program for adults. We have eight challenges for you–and you only have to complete seven of them before August 31st for your chance to win prizes. The challenges are pretty self-explanatory but I’m here to offer you a helping hand. Over the next several weeks you’ll be hearing from me a bunch as I break down each of the challenges and offer reading suggestions to help you meet your goal. Since you don’t have to do these in order, I won’t be blogging about them in order. As a cataloger I put things in order all day long so it’s a bit thrilling to deliberately get a little random. This week I’m tackling the read a graphic novel challenge. Graphic novels can either be a series of single issue comics that have been published into one volume, or they can be a standalone story that has only ever been published as one volume. For the sake of our conversation here, I will be referring to both as graphic novels. Good graphic novels can jolt you out of a reading slump. Have you ever been in a reading slump? Often it happens after reading a particularly disagreeable book (or series of books) that almost makes you not want to read ever again. It sounds pretty extreme, but a lot of voracious readers find themselves in a reading slump at one time or another. [This is not to be confused with a book hangover, which is what happens when you read a book so amazing that when you’re done you cannot imagine any other book being halfway as good as the one you’ve finished.] I’ve found that something as simple as a change of format from a regular novel to a graphic novel is enough to get my brain and imagination engaged enough to pick up another novel and try again. Great graphic novels will do all of that and also show emotion and nuance through the illustrations, sometimes even contradicting the conversation to the point that you wonder if you’re solving a mystery or watching a character have a complete breakdown. The only way to find out if a graphic novel is good or great is to pick one up and start reading! Here are just a few graphic novels I’d recommend to someone who is new to the format. Spoiler alert: you won’t find any superheroes here. There are amazing superhero comics out there, but many require you to have some understanding of the worlds in which they exist and I didn’t want to bog you down with all of that. If you end up reading these and want to try your hand at superheroes, you can check out this comics post, these graphic novels posts, or leave a comment below and we’ll chat. In this colorful and bright graphic novel Wimberly expertly brings together quotes and vibrant portraits of Black luminaries. I’ve used this book as a jumping-off point to discover voices I hadn’t heard before and then read books that they’ve written or that were written about them. I guarantee you that if you bring this book to the information desk and ask a librarian to find you more information about any one of the people listed they will happily point you in the right direction. And then maybe you can schedule some time off of work or away from your regular daily life so you have time to fully immerse yourself in these dynamic voices. Recommended for: readers who want to learn more about Black history, culture, and perspectives. Show of hands: how many of you watch the BBC modern-day interpretation of Sherlock Holmes, aka Sherlock? Now how many of you are completely obsessed with said show, lead actor Benedict Cumberbatch, and/or anything even remotely related to this reimagining of the world’s most favorite consulting detective? The episodes of Sherlock have been created in manga format in Japan and then translated back into English. I picked up A Study in Pink in 6 single-issue comic books when it first hit the states last year and was so happy to find them bound into one book I can recommend to people at the library. I love me some Sherlock, some Cumberbatch, some world’s most favorite consulting detective, and so this was an obvious choice. However, the bonus is that since I already know how the story goes from watching the show I am using this to train my brain to more quickly and easily follow the back-to-front, right-to-left so that I can start reading some of the awesome manga that the library has collected. Recommended for: readers who love Sherlock and/or want to become familiar with the manga art style and format. Hostage is a graphic memoir, which means that the events depicted really happened. While I have read other graphic memoirs none of them moved me quite like this one. In 1997 Doctors Without Borders administrator Chrstophe André was kidnapped in the Caucasus region by Chechens and kept in solitary confinement for months. The isolation is nearly insurmountable, but Christophe pushes through the days, trying to keep himself sane and hoping for either his ransom to be paid or for a chance to escape. The art and colors really play into the sense of loneliness that comes with solitary confinement in a place where you don’t speak the language and you could be killed with no warning. Recommended for: readers who want to dive into a real-life psychological struggle with an unlikely hero. Full disclosure: I probably never would have started reading Dept. H if it hadn’t been included with a comics subscription box I used to get (RIP Landfall Freight!). Reader, this is a straight-up murder mystery with a huge dash of survival adventure featuring a brave woman fighting her memories, a rapidly collapsing structure, and the press of time. Mia is hired to investigate her father’s death at a science lab at the bottom of the ocean. Oh, and his killer is obviously someone also in that science lab because no one could have come or gone without a specialized transport. The artwork is dark and moody and I didn’t think it was to my liking. I was so incredibly wrong. Matt Kindt is renown in the comics world for being innovative and for weaving stories and worlds that defy traditional comics, where the story tends to be pretty much laid out on the surface with nothing much required from the reader than to follow along. Kindt is the name you pull out at nerd parties when you want to impress a fellow nerd or drop when you go to a comic book store on vacation and they give you the “there’s a girl in the comic book store” side eye. [For the record, when that side eye happens I drop my Kindt knowledge and leave without purchasing. Misogyny doesn’t fly with me and it doesn’t fly at Everett Comics–Hi Dan and Brandon!] I’ve since started reading other Kindt creations and find myself loving getting lost in each multilayered world. Recommended for: readers who are into mysteries, survival stories, unreliable narrators, and/or strong women. Also fans of Jacques Cousteau because ocean exploration! Kate Leth is another huge name in the comics world. And while she’s written quite a range of stories and characters, including Patsy Walker aka Hellcat (a, gasp!, superhero), Spell on Wheels has instantly become my favorite story of hers yet. Three friends who also happen to be witches are making their way in the modern world while still honoring ancient rituals. But then one of their jerk ex-boyfriends steals an immensely powerful spell and several of their magical artifacts. Andy, Claire, and Jolene refuse to sit around and wait for the upcoming disaster. They meet it head-on with a road trip across the East Coast, following the trail of their stolen goods and racing against time to stop the jerky ex from unleashing holy hell on the world. Along the way they’ll make new friends and share the adventure of a lifetime. At the heart of this story are the strong bonds of friendship these ladies have with each other, and I just can’t get enough friendship stories in comics. More, please! This was a 5 issue run from Dark Horse that I really hope gets picked up for an ongoing series because seriously, once you meet these characters you won’t want to say goodbye either. Recommended for: readers who love a good road story, female friendship, and/or Charmed. Roller derby! I could probably just write that phrase over and over to fill in this space because seriously, if you love watching jammers score and blockers maneuver and maybe even know someone who skates or you yourself skate this book is for you and I really don’t need to say much to convince you. But I’ll try anyway! Slam! follows Jennifer and Maisie, two women who each live somewhat secluded lives but meet each other at the Fresh Meat (term for newbies in the derby world, keep up!) Orientation and immediately become best friends. Unfortunately, they’re drafted to different teams in the derby league. Not only will they guaranteed have to some day skate against each other, but the huge time commitments with their respective teams make spending time together really tricky. Can their friendship survive the season? This is another great story about the power of friendship and how sometimes you have to make tough choices in life where either direction makes you feel like you’ve lost something important. Recommended for: readers who love roller derby and those who haven’t yet discovered its magic. Also anyone looking for a great friendship story. Side note: this book doesn’t come out until August so if you don’t get to read it in time to count for your summer reading challenge you can still read it afterward. Stay tuned over the next several weeks as I bring you recommendations to help you complete your summer reading challenge! Comic books! I totally missed out on the awesomeness of comics when I was a kid and I find myself more than making up for it as an adult. Lately, however, I find that my eyes are bigger than my allotted reading time. It’s like being at a buffet and filling up plate after plate, but in the end you only have so much time to eat. I’m hoping to grab some time this weekend to play a little catch-up, and I thought a great way to psych myself up would be to share with you just a few of the series that are currently casting a shadow in front of my Shakespeare books at home. I’ll pair them up how I plan to read them. Maybe if you’ve already read one, you’d consider reading its complementary series? Lumberjanes was one of the first comic series I really got into reading. A group of girls meets at summer camp and form fast friendships. Soon, however, they realize the surrounding woods are home to magical creatures who aren’t always harmless. It’s up to our gals from the Roanoke cabin to take all that knowledge they gained from earning badges and apply it to the real-life situations they face. Gotham Academy is about an adventurous group of kids about the same age as our Lumberjanes. Though these kids attend a boarding school outside Gotham City, they also have their share of run-ins with the impossible. And while these two have similarities, they’re listed here together because just this month a new comic series has begun where they have put both casts of characters together in one adventure. This new team-up series is going to be one of the first comics I finish off of that giant stack pictured above. Did you know that the original Batgirl, Barbara Gordon, was a librarian? It’s true! And while the reboot of one of my favorite characters has gone in a new direction (Babs is in her 20s and in college) I’m totally loving it. There’s a lot of focus on her struggle to balance school, work, friendships, and relationships with fighting crime in Burnside (kinda like Brooklyn). Dinah Lance is a character I first met in an issue of Batgirl. She fronts a band called Black Canary…and I’m having trouble remembering more details because I’ve only read the first issue! I do remember that they’re like a magnet for trouble. All their concerts get riot-ish and it’s up to them to find out why before they start losing fans. Okay, so I’ve actually read all the She-Hulk issues and am almost up-to-date on Patsy Walker aka Hellcat. However, these two pair so well together I had to take the opportunity to tell you about them. She-Hulk, Jennifer Walters, is a defense attorney and a Hulk who can actually control her rage. Hellcat, Patsy Walker, works for a time as an investigator for She-Hulk. The two are really good friends who work well together, both professionally and personally. And they’re both willing to go the extra mile for the underdog. Who are the Rat Queens? A pack of booze-guzzling, death-dealing battle maidens-for-hire, and they’re in the business of killing all god’s creatures for profit. It’s also a darkly comedic sass-and-sorcery series starring Hannah the Rockabilly Elven Mage, Violet the Hipster Dwarven Fighter, Dee the Atheist Human Cleric and Betty the Hippy Smidgen Thief. Nimona will also appeal to fantasy fans, though again I’m not sure why I haven’t read this yet. The character Nimona is a shapeshifter who teams up with a villain and tries to prove that the heroes of the land aren’t actually heroes after all. Alan reviewed it last year as one of the best graphic novels of 2015, so I would truly be a fool to let this sit around collecting dust much longer. This is just the tip of the iceberg. If we consider my stack of unread comic books a buffet, I am planning to gorge myself and soon! What do Batman, Ms. Marvel, Constantine, and Hellboy have in common? We’ve recently rescued them from obscurity in the Dewey 741s and have given them a shiny new home in a fresh collection, aptly named Graphic Novels. Not only do these lovely books now have simplified labels and bright purple stickers, but we’ve also worked hard to put series together. We’re still working to get all the outliers together, but we’re getting somewhere and I truly believe this is a collection we can all be proud of. We finally have a graphic novel collection for adults and older teens that compliments the collections we already have for children and young adults. I’m not sure I can aptly describe how happy this makes me, so instead I’ll just do another happy dance. It just so happened that we debuted this shiny new collection the week before Emerald City Comicon at the end of March. It was my first time attending ECCC and I was completely overwhelmed with the number of artists, authors, celebrities, and vendors that were announced. There was no way I could go to everything, but I did download their convention app and created a schedule of best bets. In the end I got to meet some awesome people in the world of comics, got a sneak peek at what’s coming down the line from publishers, bought some awesome swag on the showroom floor, and got insight behind-the-scenes from various comic panel interviews. I even got to tell Paul Tobin and Colleen Coover ,the creators of Bandette, about our new graphic novel collection, an idea which they loved! Oh, and I met some Ewoks. I’m nerd enough to say that I probably fangirled over the Ewoks just as much if not more than the real live people I got to meet. Friendship to the max! Lumberjanes is the very first comic book I ever bought. The camping theme caught my eye in the aisle of Everett Comics and I bought it on sight. After reading it at home I was hooked! The story centers around a group of girls at summer camp who become fast friends over campfires and crafting. However, they soon discover that lurking in the woods is a whole other world of adventure, mythical creatures, and plot twists! This series is aimed at grades 5 & up, but don’t let that stop you from picking up the trade paperback (out later this month!) and getting caught up in the adventures of Jo, April, Molly, Mal, and Ripley. Kamala Khan is just your average girl from Jersey City dealing with typical teenage problems: hormones, strict parents, school stresses, and the like. Trapped one day in a dangerous situation, she wishes she could be like Captain Marvel and have her superpowers to get out of trouble. Through a twist of fate Kamala suddenly gains those superpowers and becomes Ms. Marvel! Join her as she discovers how to control her superpowers and learns just what it means to be a superhero–no matter your religion or skin color. And speaking of Captain Marvel, she has her own comic books, written by superstar comic writer Kelly Sue DeConnick. I’m still making my way through Carol Danvers’s back-story so I can dive into her current adventures. She’s strong, witty, and compassionate, definitely my kind of superhero. The fact that her name is also Carol is just an added bonus. In the process of writing this post I happened to run into the graphic novel buyer in the hallway. I mentioned we didn’t have any of Kelly Sue’s Captain Marvel books yet and do you know what he did? He immediately purchased them for the library! They’ll soon be on the shelves, but if you can’t wait you can place your holds here. Now it’s your turn. What comic books do you read? 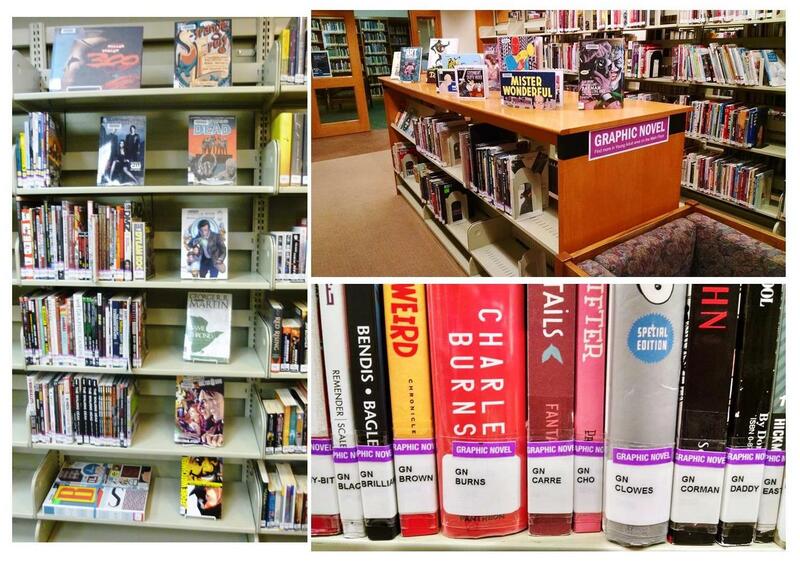 Graphic novels? Heroes and heroines who stand out? If you can’t think of any answers for my questions, I urge you to get to either branch of EPL and surf the purple stickers today.